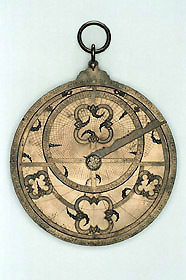 The design of the rete for this astrolabe, with its four prominent quatrefoils, is unusual, and the absence of a signature makes it difficult to determine a date and place of origin. The range of latitude plates is some help is assigning a date and place, but may be incomplete. It has been suggested, on the basis of some spellings in the calendar and zodiac scales, that it may have been made in Sicily, which was a centre for Hispano-Moorish learning in the 14th century.